Vivien Thomas's greatest dream was to attend college to study medicine. But after the stock market crashed in 1929, Vivien lost all his savings. Then he heard about a job opening at the Vanderbilt University medical school under the supervision of Dr. Alfred Blalock. Vivien knew that the all-white school would never admit him as a student, but he hoped working there meant he was getting closer to his dream. As Dr. Blalock's research assistant, Vivien learned surgical techniques. In 1943, Vivien was asked to help Dr. Helen Taussig find a cure for children with a specific heart defect. After months of experimenting, Vivien developed a procedure that was used for the first successful open-heart surgery on a child. Afterward, Dr. Blalock and Dr. Taussig announced their innovative new surgical technique, the Blalock-Taussig shunt. Vivien's name did not appear in the report. Overcoming racism and resistance from his colleagues, Vivien ushered in a new era of medicine--children's heart surgery. 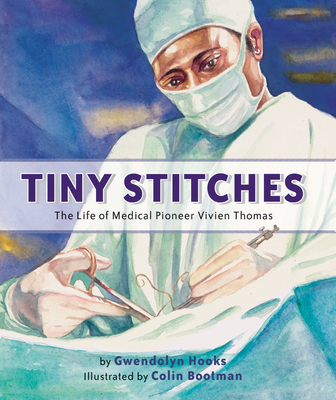 Tiny Stitches is the compelling story of this incredible pioneer in medicine.